The SL145ª stem is a perfect example of the determination our engineers display when faced with a challenge. It requires 50 sections of hand-wrapped carbon cloth, titanium bolts sourced from the same Italian producer used by the Ducati MotoGP racing program, and a stainless steel insert within the anodized black faceplate. Simply put, the SL145 was not easy to design and it’s not easy to produce. 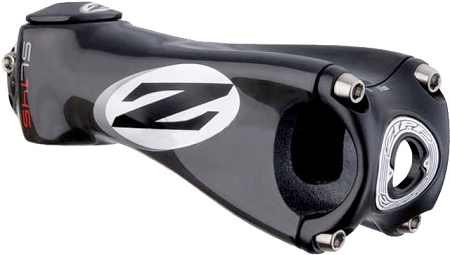 But the result is the stiffest, strongest all-carbon stem available Ð as verified by EFBe Laboratory. The SL145 is a rock-solid connection from bars to bike that weighs just 135 g (100 mm length). It’s available in lengths from 80mm to 130mm with +/- 12 degree angle and 31.8 mm clamp.